Relax on a Mat--From the book, Chill Out Fido! How to Calm your Dog. ​If you teach your dog nothing else during his life, teach him this exercise and you will reduce your dog’s stress and attention-seeking behaviors by noticeable amounts. This simple exercise teaches your dog a behavior that will help him relax his body, rather than getting excited or demanding when you are not paying attention to him. This will also give your dog a very useful tool in his toolbox. Teaching your dog to “Relax on a Mat,” is different than telling your dog to lie down. The reason you want your dog to make the choice of relaxing on a mat, rather than you asking for the behavior, is that many dogs become perplexed when their humans ask them to do certain behaviors at the wrong time. Consider what it would be like for your dog if you asked him to do something such as “lie down” when he feels anxious, is worried or excited about his situation at the time. Your dog may be able to comply with your wishes, but he may not really be relaxed or comfortable carrying out the behavior in an environment that might be the very cause of his concern. This definitely takes a toll on your leadership abilities, and your dog may give pause in future situations when you ask for that same behavior and he remembers back when your decisions might not have been in his best interest (at least in his mind). Goals of this exercise: To teach your dog how to relax on a mat when you do not want to pay attention to him, and without telling him to, “Lie down.” Relaxing on the mat will become an alternative to attention-seeking activities such as whining, jumping, barking, pawing, stealing items, dropping the ball in your lap repeatedly, and other annoying, reactive or anxious behaviors. Trained well, this skill will become so strong that your dog will choose relaxing over the unwanted behaviors. This new skill will become a default behavior—one your dog chooses all the time when he is not sure what he should do. Benefits of Teaching Relax on a Mat: This exercise will empower your dog with the ability to calm himself down, and enjoy the benefit of relaxing and recuperating his body. It will give your dog something on which to focus, as well as give him a way to resolve anxiety or stressors he may encounter in your home, or out in the world, via healthy mental exercise. “Relax on a Mat,” also teaches your dog independence from always being told what to do all the time, and in doing so, builds his confidence when he is able to figure things out on his own. In turn, this supports you and your dog’s relationship since you won’t have to “command” or tell your dog what to do all the time. The final benefit of training “Relax on a Mat” is that it teaches your dog to relax when he is on a leash, since the beginning of this exercise is always practiced on leash, teaching your dog to calm down even when he has some restrictions—a big plus for leash walking. crate mat), which can be a bath towel, bath mat or a small blanket. If you have tile or hardwood floors, find something that won’t slide around. Treats: 1/8 cup for toy dogs, 1⁄4 cup for small dogs, 1⁄2 cup for medium dogs, and 3⁄4 cup for large dogs of (pea-sized or smaller if you have a tiny dog) medium to high-value treats. Training time: 5-10 minutes, at least five times a week— twice a day is best. A well-trained behavior should be achieved in just a couple of weeks. Training location: Indoors in a quiet, comfortable place with minimal distractions. You will train in different locations with more distractions later, which will eventually teach your dog how to relax anywhere, anytime. Read the entire section before training so you have all the components in mind before you start. Put your dog outside, in another room, or in a crate for just a few minutes while you get everything ready. Place the mat in front of the chair or couch where you will be sitting, and place it close enough to you that you don’t have to stretch over your dog to drop the rewards on the mat. It is now time to go and get your dog. Put him on his leash, and then calmly walk back to the area where you placed the mat and allow your dog to find the treats that you left. As your dog discovers the food, sit down in the chair and give your dog enough of the leash to stand up, sit down, turn, and lie down, but no more. Some people like to hold the leash, others like to step on it, and still others will secure the leash around the leg of the furniture where they are working. By restricting your dog, he will learn to relax while on leash and it will prevent your dog from wandering away and finding other things in the area that are more interesting than what you are doing together. Sit back slightly, or turn to the side so you are not looming over your dog, making it is clear that you do not intend to interact with him. Most dogs respond when a person bends over them as if it’s an invitation to engage, and for some dogs this would be too difficult to resolve at this early stage of training. It's easier if you have a bunch of the treats in your hand the minute you sit down, as that will allow you to start rewarding immediately, rather than fumbling into the treat container and possibly missing the chance to reward any early calmness. To prevent your dog from discovering the treats in your hand, you can place that hand behind you between rewards. You won’t have to do that for long when your dog discovers that you drop treats when he is relaxed or calm. In this early stage of training Relax on a Mat, you are looking for any less intense behaviors than when you first started. Examples of less intense behaviors might be sniffing around the area, (maybe for more treats! ), sitting, turning his head away or yawing. Reward each of these behaviors by dropping one piece of food at a time as close to your dog’s front feet as possible, but as close to or on the mat as you can get, depending on your dog’s position. You might be wondering why you are giving treats when your dog is doing nothing more than sniffing the ground, or sitting. The best way to explain this would be for you to consider all the things your dog could be doing besides sniffing the ground or sitting, such as jumping up on you, barking at you, chewing his leash, etc. You are rewarding those spaces in time when your dog is actually doing an acceptable behavior when contrasted against the ones most people do not want! As you reward these calm moments, the calmness will start to grow stronger because, as you have learned, dogs repeat behaviors that result in rewards. Now that your dog is figuring out there is something about the mat, try to avoid dropping treats if your dog is staring at you. This is raising the bar a little, as you are now waiting for your dog to relax slightly more, rather than trying to “make” you give him treats by staring at you. By rewarding when he diverts his attention away, you will prevent your dog from feeling anxious about the food, especially dogs that are so focused on the food that nothing else matters. (Refer to the Problem Solving Section if you find this an issue). With that in mind, drop treats when your dog turns, sniffs the ground or looks away. When that happens, drop several treats in a row at his feet, in fast secession (about one every 1⁄2 second). This will teach him that looking away or sniffing around for the food is what earns the reward, not staring at you. Once you get to the point where your dog seems to understand that less activity is what is causing you to be a Pez dispenser for him, (usually about 15-30 treats later) you can now start waiting for, and only rewarding when your dog is sitting. Some dogs will lay down at this point, which is the end goal and you can skip to that section if this is the case, but remember not to ask your dog to do either behavior. The goal is for your dog to learn how to calm himself, not have you tell him. After you begin to slow the treats some, most will offer a sit, and you should reward that by increasing your treats to once per second for 10-15 treats before slowing them down to the 2-3 second range again. Once you have reached the slower reward pace, you will stop the food for a few seconds to see what happens. Does he continue to sit? If so, you can then wait a bit longer to see if he will lie down (this is a good time to do some yawning, or deep breathing to show your dog that you would like him to be even more relaxed). If your dog continues to sit, be sure to keep reinforcing this, since you don’t want him to give up, however, slow down the treats so there are bigger gaps between rewards. Three to five seconds works well. If your dog gets up from the sit at any time, take a deep breath and stop feeding until he sits again. Sitting is now the standard or criteria that your dog has set, and as you go forward from this point, you will only reward sitting until he is able to lie down. To help dogs that continue to sit and not lie down, you will again slow down the treats a little more. That space between treats will often be just long enough for your dog to get bored and lie down. If that happens, reward fast again by dropping treats between his front paws; about one per second for at least 10-15 treats, and then you can start to slow it down again. Remember, however to stop rewarding if your dog gets up, and from that point forward, you will only reward when your dog lies down, since he has now established that as the standard. of the food rewards. One time you can do a couple of fast ones, then put a few seconds between the next one, then go back to the rapid fire treats, and so forth. even more, in hopes that you will drop the next reward. Just don’t hold out too long in these early stages, since you wouldn’t want your dog to worry or become anxious about why you haven’t rewarded him in a while. If your dog keeps getting up between rewards, you will need to speed things up for him, and drop your treats faster until he understands that lying down and remaining there is the answer. Once your dog is very skilled at this behavior, you will only need to “pay off” every now and then, as the exercise becomes rewarding in itself. Refer to the “Fading the Treats” section in Chapter 4 for more information about getting rid of food rewards. You are now on your way to teaching your dog how to calm himself down. Keep in mind, however, if at any time your dog gets up from the down position after this level of progress, take a deep breath, turn your head away and stop dropping food. Let your dog process this and figure out that it was the lying down that was making you drop the treats. It only takes a couple of times for most dogs to have the light bulb go on and decide this is very easy to do and it pays off big! After 2-10 minutes of training say, “All done,” remove the leash and put everything up until the next time, remembering that the first two sessions should be completed within 1-8 hours to have the maximum impact on your dog. so as not to get him worked up all over again. It’s important that your dog understands that training will stop when you say, “All done,” so he is a little disappointed that you are no longer going to engage with him. This helps ensure that the next time you bring out the mat he will be more willing to focus and find out what makes you drop the treats. As you progress, think about raising the bar a little each time you come back and train. The next goal might be for your dog to shift his weight on to one hip, which is a much more relaxed state for dogs, (some dogs will lie with their legs splayed like a frog as they relax and that is okay as well). After you reward the initial down, slow the rewards again to the 2-5 second range until you start to see your dog shift his weight, even just a little, then speed up the rewards again so your dog can arrive at the conclusion it is shifting his weight that now makes you drop the rewards faster again. what he has offered. Stay at this level until you have reduced the reinforcement rate to the varied reward schedule with your dog staying at the 3-5 second intervals between rewards until you have completed a couple of days at this stage. Once you have your dog on his hip, you can then wait for an even more relaxed state by rewarding your dog for looking away from you, or lowering his head and resting it on the mat, and then dropping your treats. To achieve this, you will slow down your rewards again until you see your dog’s head turn or dip toward the mat, and then speed up the reinforcements again once he has offered one of those postures. Taking deep breaths or yawing will help your dog relax faster, so be sure to add that to your training. Ater you are able to get all of these components, lying down on a hip and not staring, you are ready to move to a new location. Each time you move to a new location, go faster with your rewards for the first 10-15 seconds after your dog has lain down, and then slow it down again. Be sure to practice for a couple of days in each new location before moving to the next one. Dog does not lie down after 10 minutes: If you have worked on Relax on a Mat for a full 10 minutes and your dog has not be able to lie down, it’s time to stop and take a break. It doesn’t matter where your dog is at this point in the training, you want your dog to be a little disappointed that you are going to end the exercise, not have him filled up on food and/or bored by the exercise. Stop training, and be patient. Your dog will eventually down if you work through the exercise as explained. If you come back and work on this with in an hour or two, your dog will be a little full, and shouldn’t be as excited about the food and may become bored enough to lay down. 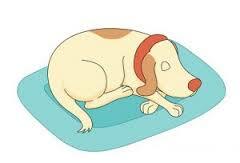 You can also train at times when your dog is sleepier. Dog seems frantic about the food: If your dog starts showing any signs of stress or greater activity when you slow or stop rewarding to check what he might do next, you should go back to dropping the food on the mat a little faster, and just let him eat, one treat at a time. This is the time to reward in fast succession again until you have placed about 10 or so treats on the mat, and then say, “All done,” pick up the mat and put it away until a little latter. This will allow your dog some time to calm down and digest some of the rewards so he won’t be frantic about getting the food. You can also use less valuable food, such as your dog’s regular dry food, with just a few higher valued treats mixed in, so he isn’t quite as interested in the food. You can also train when your dog is not quite as hungry, such as after a meal. Dog whines or barks: If your dog whines or barks, take a deep breath and turn your head to send a clear message that you are not going to interact with him. Try dropping your treats faster when your dog is not whining or barking to help him stay focused on the exercise, rather than demanding the food. You can always end the session if your dog seems to be overly anxious. Wait an hour or so and try again. Dog jumps up on you: If your dog jumps on you during this exercise, gently stand up, turn slightly away (be sure that you don’t make eye contact or talk to your dog) and allow your dog to slide off of you and sit right back down. Be sure not to push with your hands, as that can be exciting or arousing for many dogs and the intent is to work toward calmness, not escalate his excitement. It might be necessary to stand up a couple of times before your dog gets the message that you are not going to interact, although most dogs get the message pretty quickly. Drop several treats in a row just as you are sitting down again, to sustain your dog in the “four on the floor” position. the leash. Remember that leash biting is usually a sign of stress, so helping your dog understand what you want by quick reward delivery should help him get into the game and leave the leash alone. at the table. In the beginning, do this when you are not eating a meal so it’s easier for your dog. After a couple rounds without a meal on the table, add a meal with only you, (add family members later) rewarding him for lying on the mat while you eat. When your dog is able remain on the mat while you eat, graduate to having family meal, if that’s the goal. You will still be working with your dog’s leash at this point, but as you will see, the leash will not be needed once you have trained this well. If you would like your dog to stay out of a certain area, such as the kitchen when you are working, place his mat on the edge of the kitchen and reward any time he is on his mat but ignore him if he gets off. Your dog will quickly learn that being on the mat, even when you are working in the kitchen will pay off, and he will figure out that chilling out on the mat is much easier than bothering you. Be sure to practice this training to many different areas in your home before you take it on the road. Do not new locations, however, until your dog has started lying down on his hip, and not looking at you. You will want all of that in place before trying new locations. You can start to raise the bar, by adding more time between treats, distractions or a new location. Only add one of these components at a time or it might be confusing and your dog may not want to continue with his training if he thinks it’s not fun or he has to work too hard. rewards in the early stages. Act as if your dog just started 5 part where he is lying down so he gets that high rate of reinforcement in the beginning and then wait for the hip movement and finally the looking away. Once you have the completed behavior, move to the variable rate of reinforcement after you see that he understands you are doing the same exercise, just in a different place. This usually transcends swiftly if you have trained it well in the original location. After your dog has learned to relax on the mat with ease, do it without the mat occasionally so he learns that when he relaxes, rewards happen even without the visual cue. Back this up with rewarding your dog any time he chooses to relax, and you will create a dog that knows how to calm himself down, and has a default behavior of lying down when he is not sure what the answer is. To further this training, switch to not using a leash and practice around the house by rewarding your dog for lying on the mat when you bring it out. Switching to off-leash is a great way to teach clingy dogs how to distance themselves from their humans—just put the mat a little further away each time and get really good at tossing treats to your dog at a distance. It won’t take long for your clingy dog to “want” to be away from you. Finally, practice this exercise on leash again, but now do it while you stand in place, and without the mat. This will teach your dog how to be calm on a leash when you are standing—a great skill for any dog when out in public. learn to relax and lie down when you are out in public and have him on a leash. This is a great way to build a foundation for loose leash walking as well, because your dog learns to stay near you while on the leash, and to relax next to you, rather than pull away from you. Be sure to practice or generalize this behavior all over the house before taking it on the road, just as you did with the other parts of this exercise.